It is the Fifth of October and this post was meant to be up yesterday morning but Grace procrastinated on getting out of bed so she is now facing the consequences of procrastination. Leaving messed up blogging schedules aside, I'm about to kick off Halloween 2014 on Dainty Sprinkles so you need to have your black eye pencil, fake blood and blusher out and ready as I have plans for a ton of spooky posts. 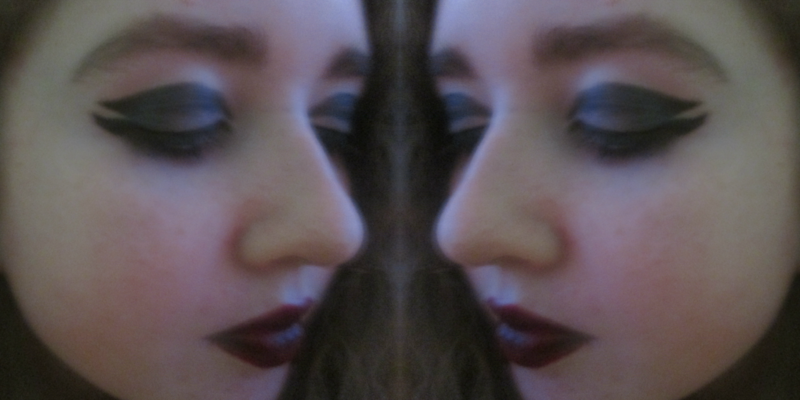 Today we are focusing on a wearable Morticia Addams look ! As always, Blogspot is being lovely and won't let me insert my YouTube video so click here to watch it if you're like me and prefer video to text when it comes to these kind of things ! 1. I first lined my lashline and my crease with a black liner pen, winging them both out at the side. Finishing this, I filled in the space between the beginning of the wings. 2. Starting on eye shadow, I applied a grey shade all over my eye lids. 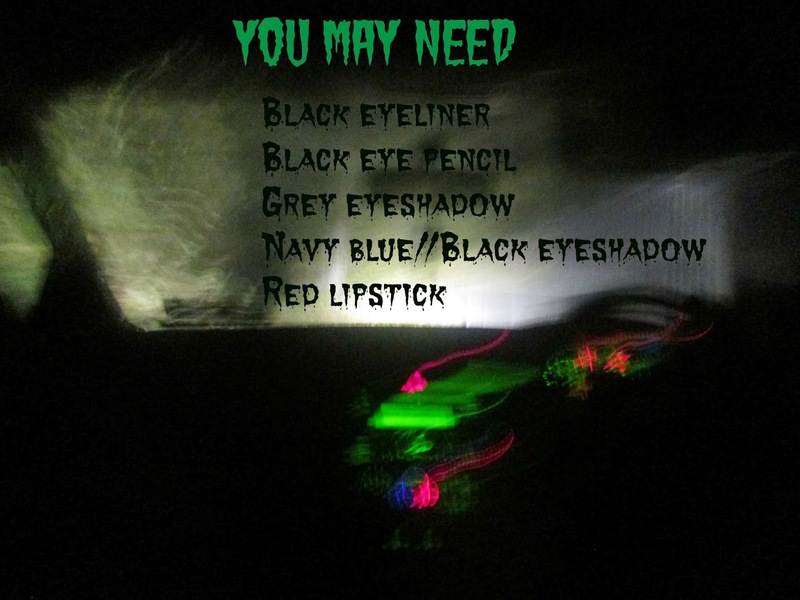 I used two navy blues in the crease and outer corners although if I actually owned black eye shadow, I would have used that instead. 3. Although pencil proved not to be a half decent substitute for eye shadow, it was brilliant for lining my lower lash line with a black shade to intensify the eye makeup - Using a heavier mascara than usual also helped with this idea if you're wondering. 4. 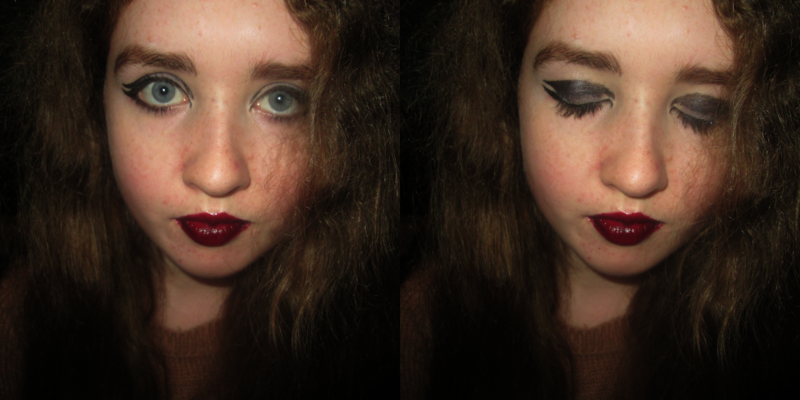 The finishing piece of this look is the gothic red lipstick that Morticia is known for. To create a darker look, black pencil was added to the corner and various random areas over the red and we're finished ! 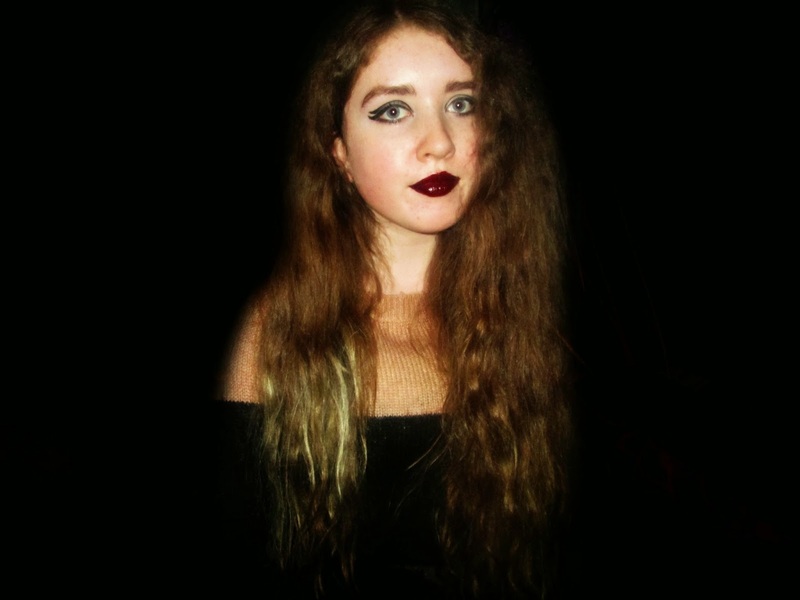 Above is the completed look which I wore to a ghost bus trip that evening which is why the lighting is horrendous but appropriately spooky and dark. I did want to make this look wearable whilst gothic//Halloween-y//spooky//whatever you call it but if you do want to go full out with this on Halloween night, black raised eyebrows and grey contouring are your best friends ! Last night I went to the Blog Awards Ireland, I am still so chuffed to have made it as a Finalist in the Best Youth Blog category and feel like I should thank you all for your good luck comments and tweets ! I'll be talking about the evening in my next blog post when I'm no longer half asleep at my desk - we were kept awake by rowdy eejits making noise outside all night ! Great post! :D My spirit animal is Wednesday Addams :D She is life. Thank you :D She is queen ! Oooh this looks really cool! Uh no. There are so many things wrong with this. If you are going to have a makeup blog, invest in some foundation, eye primer, bronzer, learn to apply lipstick right and for the love of god pluck your eyebrows. And if mommy says you're too young to do any of this then maybe you shouldn't be on the internet doing makeup blogs.